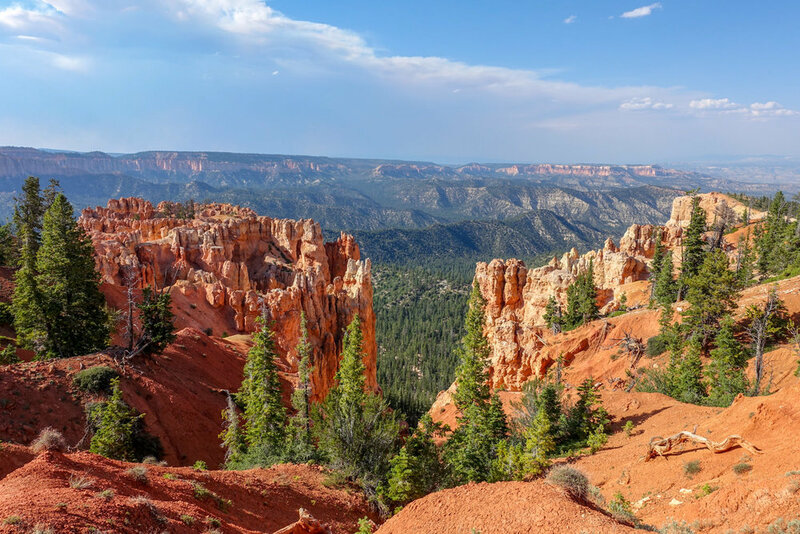 One of the nation’s smallest national parks, 56.2-square mile Bryce Canyon National Park in south-central Utah isn’t really a canyon in the usual sense. Comprised of a series of more than a dozen horseshoe-shaped chromatic limestone amphitheaters on the eastern edge of the Paunsaugunt Plateau, it’s a wonder of wind and rain erosion that has resulted in a maze of slot canyons, windows, and & spires. Bordered on the rim by ponderosa pines, high elevation meadows, and fir-spruce forests, it’s also an awe-inspiring place to backpack. 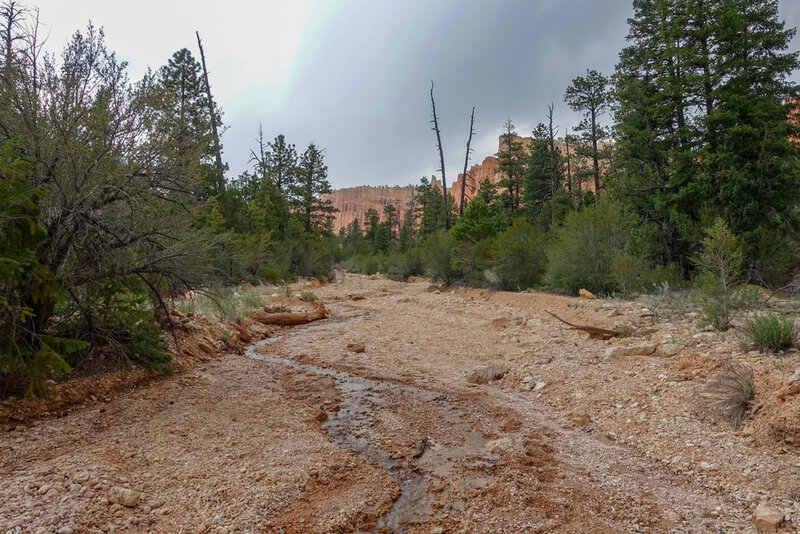 Combine the 23 miles of the point-to-point Under-the-Rim Trail with the 8.8 miles of the Riggs Spring Loop Trail at the end, and enjoy 31.8 miles of what is often called some of the world's best air quality. Besides making it easier on the lungs, clean air also means easier on the eyes. You can literally see for 200 miles across a panorama of three states. It also means that on a clear night, the lack of light pollution provides unparalleled stargazing. Relative solitude, but expect to see day hikers around trailheads. In general, June through September is the best time to hike the Under-the-Rim Trail, but in some years you may still be able to hike as early as April. Snowpack is a key factor for trip planning in this area, as snow can linger in the canyon into April. During summer months, temperatures can reach into the 90s during the day and drop into the low 50s at night. As always, be prepared and diligent in monitoring current conditions as weather can change quickly in the mountains. Before heading out, check the National Weather Service for up-to- date conditions. We rate this hike as moderate due to its ascents and descents. As always, difficulty ratings depend on your experience, physical fitness, pack weight, and weather conditions. Although not a technically demanding hike, it requires careful planning for water resources. Like any backpacking trip, you should plan accordingly, train properly, know your limitations, brush up on your skills, and dial in your gear. Doing so will make for a safe and enjoyable adventure. In addition to the required $30 National Park entrance pass ($80 for an annual pass), permits are required for all overnight stays. The cost is only $5 per person for a backcountry permit for your entire stay. Purchase permits at the Visitor Center from 9 a.m. until one hour before closing. BCNP only allows advanced reservations to be made up to 48 hours before you start, and can only be made from the visitor center. At a minimum, we recommend obtaining your permit the evening before you plan to hike instead of in the morning to ensure you can get on the earliest shuttle possible. 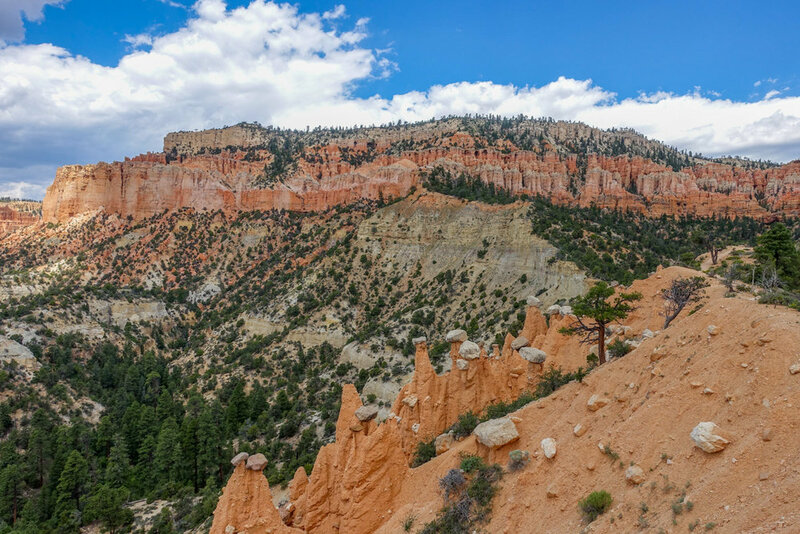 The Under-the-Rim Trail starts at either Bryce Point trailhead or at the southern trailhead, Rainbow Point. Though both are options, we recommend beginning the hike at Rainbow Point for an easier elevation profile. 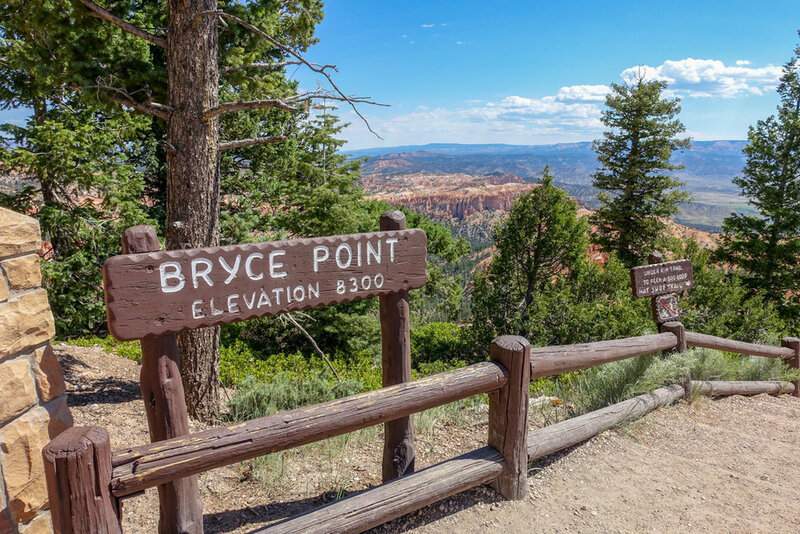 STARTING AT BRYCE POINT - If you start at Bryce Point, the trail descends from the northern section of the park, trending first east and then south away from the amphitheater at an average distance from the edge of the plateau at about 0.62 miles (1 km) and ends in a significant climb back up at Rainbow Point. STARTING AT RAINBOW POINT - We recommend starting at Rainbow Point, completing the Riggs Spring Loop Trail, also known as the Riggs Spring Fire Trail, first. Then walk a short ways to the start of the Under-the- Rim Trail. The reason is that going South to North means less climbing at the end of your trip, and may require carrying less water over the long haul because of the where the most reliable water sources are. The Under-the-Rim trail descends eastward from Rainbow Point in the southern end of the park, swings north and west before making an eastward swing toward the Grand Staircase Escalante National Monument boundary and then back north to over the last 10 miles to the finish at Bryce Point. The Bryce Canyon Shuttle buses are free once you pay your entrance fee and include anyone traveling with you. The park administrators strongly encourage you to leave vehicles outside the park, especially if you're not staying overnight inside the park. Park near Ruby's Inn, on the left side of the road before entering the park or at Ruby's Campground, walk 0.2 miles, and board the shuttle at the Shuttle Station. The Bryce Canyon Shuttle provides free transportation to and from Bryce Point during summer months. A separate shuttle offers a daily guided tour to Rainbow Point, free of charge, beginning April 13, twice daily (at 9:00 AM and 1:30 PM). It's important to note that reservations are required for the Rainbow Point Tour. Make them in person at the shuttle offices at Ruby’s Inn, Ruby’s Campground, the Shuttle Parking area building or by calling 435-834- 5290 between the hours of 8:30 AM and 5 PM. Reservations can be made up to 24 hours in advance. Buses will hold up to 45 passengers and are first-come, first-served. 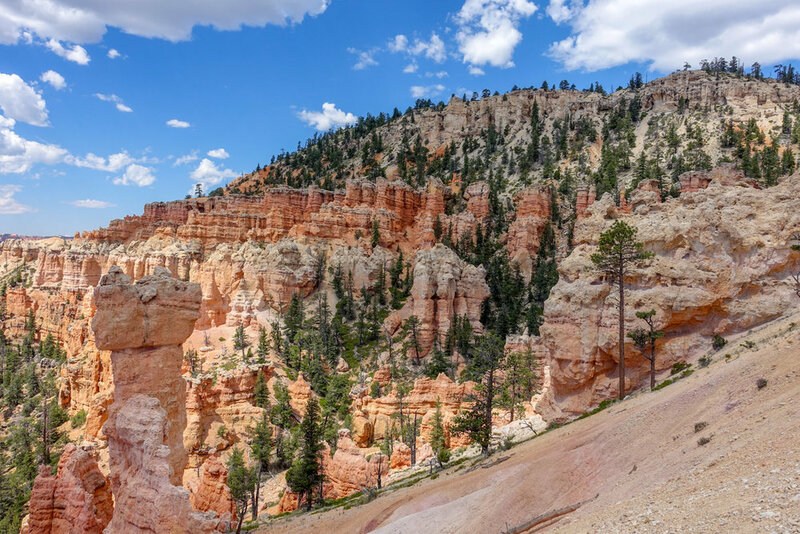 If you are taking the Rainbow Point Shuttle to access the southern trailhead, you'll be exiting the Under-the-Rim trail at Bryce Point, where you can hop on the shuttle back to the Shuttle Station. There are 4 campsites along the Riggs Springs Loop Trail and 8 along the Under-the- Rim-Trail. All sites are first-come, first-serve for parties of six or fewer people. For more information on backcountry campsites, visit the NPS site. Backcountry campsites are limited to 6 people per regular site, and 15 people per group site. Below are the campsites along the Riggs Spring and Under the Rim route. Sheep Creek (Due to bear activity, the Sheep Creek campsite is closed to overnight use until further notice). Below is a map provided by the Bryce Canyon National Park showing mileage, campsites, and the general route elevation of the Under the Rim and Riggs Springs Loop Trail. Most people complete the combined trails in 3-5 days. Below are a few sample itineraries. For more information on mileage between campsites, please refer to the Bryce Canyon NPS website. This trip itinerary allows for extra time to explore this spectacular region and take side trips to Static Peak and The Wall. Both Riggs Spring Loop and the Under-the- Rim Trail follow well-defined and established routes. During peak season the trail is lightly used, but the risk of getting lost is pretty low. Still, you should always carry a map since it provides additional useful information, as well as routes to side trips easily accessed off the main trail. Below are some helpful resources when planning your visit. information about elevations and key landmarks. Best Backpacking Trips in Utah, Arizona, and New Mexico - This book offers detailed trip information for this trip, as well as other great backpacking trips in the SW.
National Geographic Trails Illustrated Bryce Canyon National Park Map - This map offers excellent detail of the entire park, but also of the Under-the-Rim Trail and Riggs Spring Loop. Bryce Canyon NPS.gov - This NPS website is a great resource for trip planning, campsites, routes, etc. We recommend that you carry at least one gallon (4 liters) of water per person per day into BCNP backcountry. We like using sturdy yet light Platy Bottles for toting water. Water sources are intermittent and unreliable for the most part on this hike. Water from backcountry sources should also be purified. We used Aquamira drops as our main treatment method on this hike. A lightweight water filter or UV purifier would be a good choice as well. Check out our best water purifiers’ list for our top recommendations. Yellow Creek (near all campsites). Riggs Spring (inside log fence area). Yovimpa Spring (below Yovimpa Pass campsite) - We found this to be the best water source on the entire hike by far. Either carry your waste out or dig 6 to 8 inches (15 cm) deep “catholes” at least 100 feet (30 m) away from water, trails and campsites to bury human waste. Wash dishes and bathe at least 100 feet (30 m) from water sources, trails and campsites. Collect and bag food scraps and pack out as trash. Feeding or harassing wildlife in the park is a violation of federal law. Campfires are not allowed in the backcountry. Camp stoves are permitted. Bears have become an issue in Bryce Canyon National Park in the past few years. According to the park rangers, in the summer of 2010 a black bear had to be killed because it had become accustomed to handouts and exhibited repeated aggressive behavior towards backpackers. Bears often lose their natural fear of humans when they become habituated to human food. Don’t let fear keep you from backpacking here. Instead, read about how to handle a bear encounter. To combat this issue, BCNP highly recommends the use of bear-resistant food containers on overnight backcountry hikes. The park service will loan you a free bear-resistant canister at the Visitor Center. Store all food and scented personal items in the it. Chances are you're more likely to have issues with ravens, mice and squirrels. They sometimes peck or chew into packs and tents left unattended. Follow proper food storage techniques and this shouldn't be a problem. To learn more about food storage, check out our Food Storage video. Mosquitos are not usually a huge problem in Bryce Canyon, except when there have been extensive periods of wet weather prior to your arrival. The same holds for no-see-ums, though, like skeeters, most are only an issue around dusk. Use a combination of permethrin on your clothing and a small amount of DEET on exposed skin for full protection. TENT: We brought the NEMO Hornet 2P on this trip for its lightweight livability and convenience. Check our our list of the best lightweight backpacking tents for our top recommendations. BACKPACK: We used the ULA Circuit backpack on this trek. It's ultralight, convenient, comfortable, and makes our list of the best lightweight backpacking packs. SLEEPING BAG: We used the Enlightened Equipment Revelation quilt on this trek for warm desert night time temperatures. It's lightweight, warm, and make our list of the best backpacking sleeping bags and quilts. SLEEPING PAD: We used the Therm-a-Rest NeoAir XLite sleeping pads on this trip. They're light, comfortable, warm, and make our list of the best backpacking sleeping pads. COOKING SYSTEM: We used the JetBoil MiniMo on this hike, all of which make our top picks gear list and best lightweight stoves list. SHOES OR BOOTS: We wore Altra Lone Peak 3.5 trail runners on this trail and they were excellent. If you prefer boots, make sure they’re lightweight and break them in really well before your trip. Here’s why we prefer hiking in trail running shoes: 5 Reasons to Ditch Your Hiking Boots. Also, here's our top picks for the best backpacking footwear. WATER PURIFIER: We used Aquamira Chlorine Dioxide Drops as our main purification method on this trip and it worked well. Check out our Best Water Purifiers list for other good treatment options. FOOD: When backpacking this route you'll have to carry all your food. Check out our Best Lightweight Backpacking Food Guide and our Best Freeze Dried Backpacking Meals for some of our go-to recommendations. 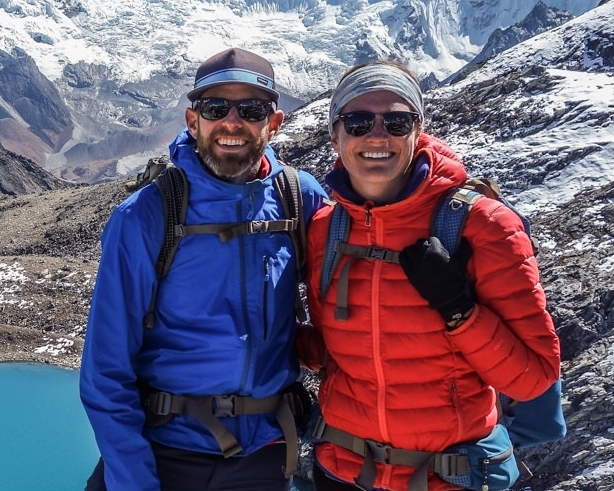 CLOTHING: Here are some of our favorite hiking/backpacking clothing items from our Top Gear list. MAP, COMPASS & GPS: Both Riggs Spring Loop and the Under-the- Rim Trail follow well-defined and established routes. For more info, read Maps & Guidebooks sections above. In addition, we always hike with a topo map, quality compass, and Gaia GPS . SUN PROTECTION: Sunglasses (polarized recommended), sunscreen, and spf lip balm are an absolute must on every backpacking trip, especially for an exposed trek like this. INSECT REPELLANT: Though there were few insects on this trip, we usually pack a small bottle of 1oz bottle of DEET. You can also treat your clothing with Permethrin prior to your trip, but this may be an overkill for Reflection Canyon. We hope this guide helps you plan your trip in Bryce Canyon National Park. Leave a comment below if you have any recommendations, questions, or suggestions. And if you found this guide helpful, please share and click the little heart button below to give us a digital high five!